Beat the crypto market, trade on Binance and trade XLM smartly. No coding required. Coirule has one main goal, we want to make your day trading more effective and profit-making. Cryptocurrency markets run 24/7, only an automated crypto bot can fully seize any possible opportunity that will develop in the crypto space. How to program a order for XLM with Coinrule? Determine your automatic strategies using the If-This-Then-That system, no coding skills required! In a unified instrument board connected to Binance, you will find all essential aspects regarding your automatic trades. You can easily control them, freeze and run them at any time so you have perfect control of your investment machine. Coinrule's safety systems are designed for maximum de-risking. We will never ask for Binance withdrawal rights. Your API Key is retained with guaranteed security outside our servers. 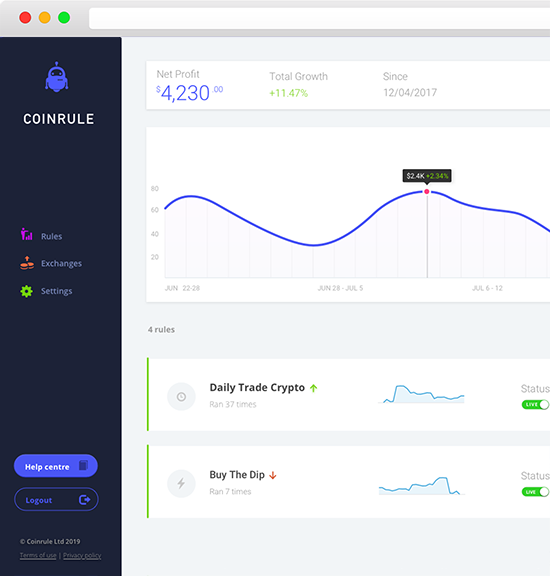 Trade with Coinrule on Allocation, with an encrypted techonology. We want to offer a engine that adheres the highest abilities. we are in association with our most qualified clientss to advance our product daily. Get in connection with us and reserve a One-to-One individual trading session! Receive free trading signals, createstrategies and manage your portfolio for 30 days for free.